The Virtual Environment and Multimodal Interaction (VEMI) Laboratory, directed and operated by Dr. Nicholas Giudice and Dr. Richard Corey, is part of the Spatial Informatics program in the School of Computing and Information Science at the University of Maine. The VEMI lab is an educational, research, and development facility based on a collaborative model where faculty, undergraduate, and graduate students across more than a dozen disciplines learn about scientific research, creative design, and technical skills using the latest virtual and augmented reality technologies. 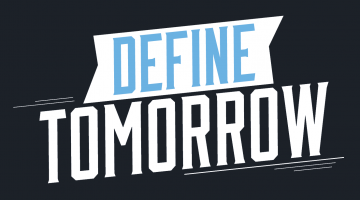 Our mission is to conduct world-class research and to provide students with the training they need to be leaders in today’s It-workforce or research-driven careers. 1) The design and evaluation of cutting-edge information-access technologies to improve environmental awareness, spatial learning, and navigation for people with visual impairments (blind individuals, older adults, and anybody who is visually distracted, such as texting while walking). 2) Studying the human interactions for optimizing the accuracy, efficiency, and safety of autonomous vehicles (the fastest growing, yet least studied class of transportation). 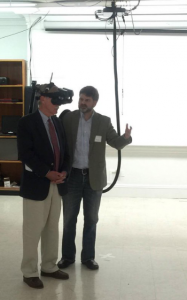 Pictured above is the VEMI Lab Director of Operations Dr. Richard Corey demonstrating some of the Lab’s virtual environments to Senator Angus King. Three key factors set VEMI apart from any other facility in the world: our research approach, our team, and our technology.